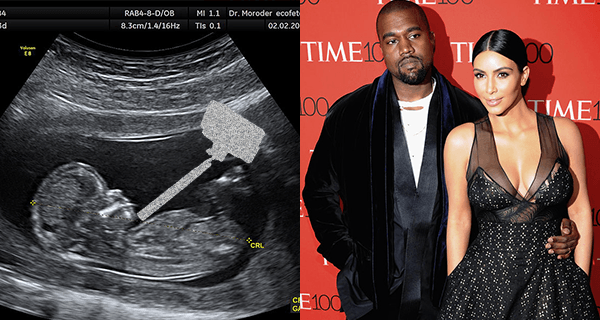 Kim Kardashian and Kanye West have announced they’re expecting a second child, but a trip to the doctor’s revealed some even more exciting news: a selfie stick has formed alongside the fetus, marking the world’s first in utero selfie stick. According to the ultrasound, the device started to grow three weeks ago, but not until this week had the fetus’ hands developed enough to use it. Now that it’s able to hold the selfie stick, the unborn child appears to be practicing different expressions and poses. “She’s beautiful,” said Kim while viewing the ultrasound. “Especially in that second pose.” Quickly after, her phone buzzed: a new user named BabyWest2 had just started following her on Instagram. The doctor told the couple they could expect hashtagging to start around the 18-week mark, roughly the same time the fetus has formed an understanding of its best angles. However, he assured them it would be able to favorite, like, and comment a few weeks before then. Wanna see more selfies defying the laws of science? Check out Planets Gone Wild: Space’s Sexiest Selfies.